The thing I like about salads is the creative license that can be taken when building them. There are so many options of ingredients to choose from. Which greens? Just one type, or a mix of lettuces? What kind of dressing? Should I add fruits? How about nuts? Maybe I’ll cook parts of it to make a warm salad…etc, etc… Here is the vegetative creation that I made for my lunch today. 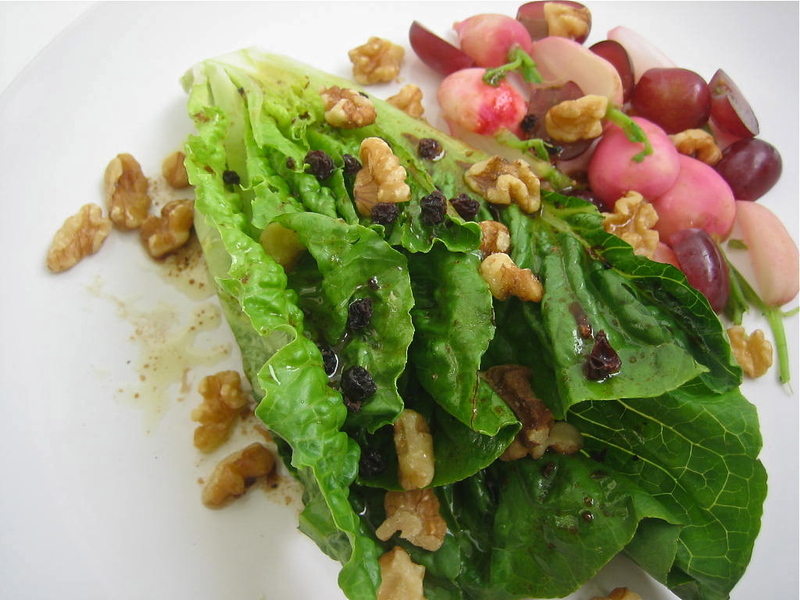 It is simply a wedge of romaine lettuce, sprinkled with a few items from my pantry, and served along with some grapes and blanched radishes. This recipe is loosely formulated, I’ll let you decide how much of each you want. And of course, feel free to switch out any of the ingredients. After all, it’s your salad! 1. Blanch the radishes: bring a small pot of water to a boil, then add the radishes and boil until tender. Remove radishes from pot and submerge in cold water to stop the cooking process. Drain, set aside. Wash and cut the grapes in half, set aside. 2. Depending on the size of the romaine lettuce head, and the size of salad you want, cut lengthwise in half or quarters. Place lettuce wedge, cut side up, onto serving plate. Sprinkle some walnut and dried currents over it, then drizzle with some extra virgin olive oil and balsamic vinegar. Season with a pinch each of salt and pepper. Serve with the radishes and grapes on the side.